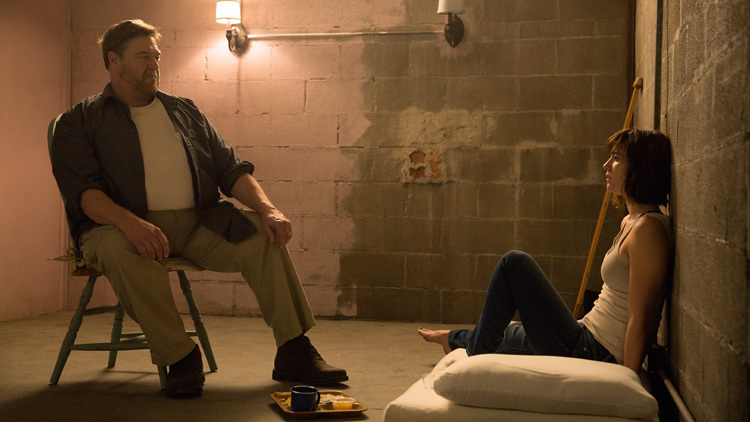 As “10 Cloverfield Lane” opens, we don’t know precisely what is happening. Even if Michelle (Mary Elizabeth Winstead) is taking what appears to be a distraught phone call, we can’t tell the meaning of the conversation, because director Dan Trachtenberg doesn’t let us hear it, choosing instead to drown out the dialogue with music. Eventually, after Michelle packs a few boxes, climbs in her car and high-tails it into the countryside, we come to learn she is fleeing a boyfriend, though even then we don’t know precisely why. It’s emblematic of the whole movie, which generates suspense by withholding, both from us and from Michelle, who gets into a sudden car accident and then wakes up in an underground bunker chained to the wall where her captor, Howard (John Goodman), claims to be her savior from sort of “attack” that has just happened above ground and in all likelihood left the air above contaminated and lethal. The foremost question the becomes “What’s really up there?”, though Trachtenberg, working from a screenplay by Josh Campbell, Matt Stuecken and Damien Chazelle, is determined to delay the answer by asking all sorts of smaller questions first. Like, is Howard nuts or just socially awkward? Like, is this guy Emmitt (John Gallagher Jr.) who’s also down here just gregariously clueless or does he know more than he lets on? Like, is that a car Michelle keeps hearing up above, or something else? “10 Cloverfield Lane” plants all these seeds and then uses them to string us along via one of those narratives where you can practically see every gear as it locks into place, sniff out every set-up as it’s happening and detect every fake-out before its reveal. Yet even if we can, and this is crucial, you never believe that Michelle can, because Winstead entirely sells her performance as a person in the moment, where she is seeing, sizing up, determining a course of action, and then acting. And her performance, and the others, go a long way in keeping a lid on the farcicality that this overly plotted movie could otherwise accidentally let pop out at any minute. Even so, Goodman and Winstead’s characters are never much more than agents of the plot. Howard has a daughter to whom he continuously refers, not out of love so much as Who Was She and What Does She Mean? Michelle is made a fashion designer simply to advance the plot at moments when there would be no other way forward. Emmitt, in fact, is the only character allowed to have any kind of lived-in backstory, almost entirely relayed in one monologue where he talks about deliberately living his life in a 40 mile radius. When he lists his regrets if this really is The End, you feel for him, partly because Gallagher Jr. sells it, partly because it’s the film’s only real attempt to foster humanity. And that makes his character’s trajectory most unfortunate; he is deserving of better than existing simply to allow for an O.M.G. I kept thinking of how Jane Campion might have approached one woman trapped in a bunker with two men during a possible apocalypse, and imagined all the psychological alleys she would have explored, because those are not alleys Trachtenberg considers, sticking entirely to the action-adventuring main road, not even really interested in the idea of Howard configuring Michelle in his daughter’s image beyond a means to ramp up the drama of the waiting game. And that’s mostly what “10 Cloverfield Lane” is – a waiting game, where you wait and wait for the obligatory Big Twist, which I won’t reveal and is where the movie finally, strangely gets a handle on what it wants to be and makes you wish it could have been all along. The Big Twist, and what ensues, still feel strange, apart from everything that has preceded it, like a different movie, which sounds like a bad thing, though it actually isn’t. It’s difficult to discuss without referencing specifics, which I won’t, even though I want to drop, like, a couple full paragraphs on a single shot and how it plays off one from a different movie (this one, to be exact, though SPOILER ALERT! if you clink on the link). Yet this is where you begin to see what Winstead was up to, and why her characterization is jettisoned rather than built as the film goes along. What precedes the rousing climax isn’t tangential but essential; in a cosmic kinda way, it’s her boot camp.